Some days/weeks/time ago, I did a presentation at MeasureUP called "Docker For People Who Think Docker Is This Weird Linux Thing That Doesn't Impact Me". The slides for that presentation can be found here and the sample application here. The sample application is just a plain ol' .NET application. It is meant to showcase different ways of doing things. One of those things is data access. You can configure the app to access the data from SQL storage, Azure table storage, or in-memory. By default, it uses the in-memory option so you can clone the app and launch it immediately just to see how it works. Quick summary: Calgary, Alberta hosts an annual event called the Calgary Stampede. One of the highlights of the 10-ish day event is the pancake breakfast, whereby dozens/hundreds of businesses offer up pancakes to people who want to eat like the pioneers did, assuming the pioneers had pancake grills the size of an Olympic swimming pool. 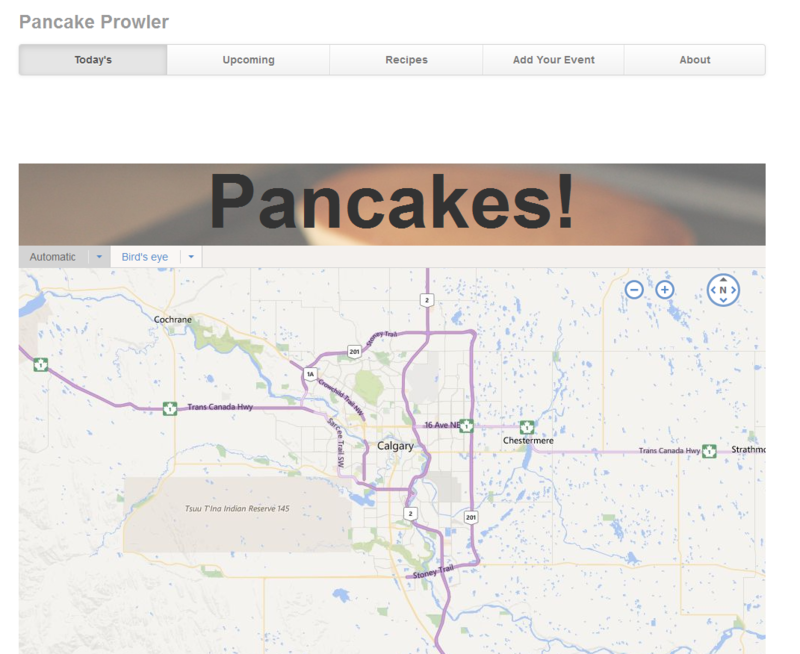 The sample app gives you a way to enter these pancake breakfast events and each day, will show that day's breakfasts on a map. There's also a recipe section to share pancake recipes but we won't be using that here. psql -U postgres -a -f "C:\path\to\sqlfile.sql"
At this point, you can launch the application and create events that will show up on the map. If you changed the username and/or password, you'll need to update the Postgres connection string first. You might have noticed that you didn't create any tables yet but the app still works. The sample is helpful in this regard because all you need is a database. If the tables aren't there yet, they will be created the first time you launch the app. Note: recipes rely on having a search provider configured. We won't cover that here but I hope to come back to it in the future. Next, we'll switch things up so you can run this against Postgres running in a Docker container. I'm going to give away the ending here and say that there is no magic. Literally, all we're doing in this section is installing Postgres on another "machine" and connecting to it. The commands to execute this are just a little less click-y and more type-y. The first step, of course, is installing Docker. At the time of writing, this means installing Docker Machine. postgres The name of the image you are creating the container from. We're using the official postgres image from Docker Hub. If this is the first time you've launched Postgres in Docker, it will take a few seconds at least, possibly even a few minutes. It's downloading the Postgres image from Docker Hub and storing it locally. This happens only the first time for a particular image. Every subsequent postgres container you create will use this local image. psql -h 192.168.99.100 -U postgres -a -f "C:\path\to\sqlfile.sql"
The only difference is the addition of -h 192.168.99.100. 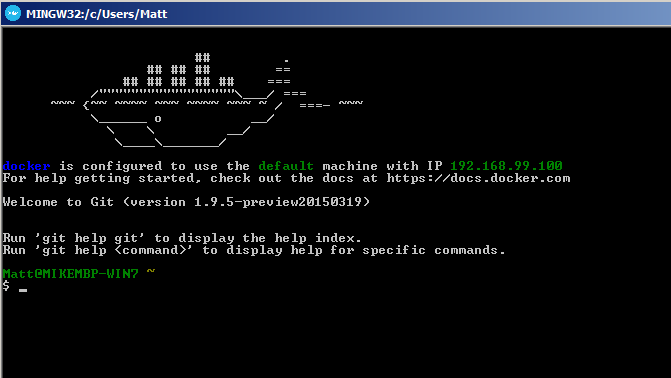 You should use whatever IP address you got above from the docker-machine ip default command here. For me, the IP address was 192.168.99.100. With the database and user created, and your web.config updated, we'll need to stop the application in Visual Studio and re-run it. The reason for this is that the application won't recognize that we've changed database so we need to "reboot" it to trigger the process for creating the initial table structure. Once the application has been restarted, you can now create pancake breakfast events and they will be stored in your Docker container rather than locally. You can even launch pgAdmin (the Postgres admin tool) and connect to the database in your Docker container and work with it like you would any other remote database. I also highly recommend Nigel Poulton's Docker Deep Dive course on Pluralsight. You'll need access to Linux either natively or in a VM but it's a great course. There are also a number of posts right here on Western Devs, including an intro to Docker for OSX, tips on running Docker on Windows 10, and a summary or two on a discussion we had on it internally. Other than that, Docker is great for experimentation. Postgres and Elastic Search are both available pre-configured in Docker on Azure. If you have access to Azure, you could spin up a Linux VM with either of them and try to use that with your application. Or look into Docker Compose and try to create a container with both. For my part, I'm hoping to convert the sample application to ASP.NET 5 and see if I can get it running in a Windows Server Container. I've been saying that for a couple of months but I'm putting it on the internet in an effort to make it true.